Three players are sent-off as Ballniamalladr beat Glentroan 1-0 at Ferney Park. Substitute keeper Elliott Morris, not deemed fit enough to start, came on to save Jason McCartney's penalty before Glentoran's Stephen Gordon and home player Johnny Lafferty were red carded just before the break following a melee involving most players on the pitch. 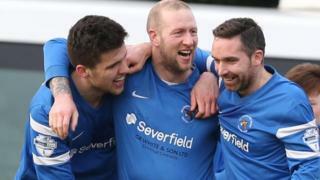 Ballinamallard took the lead on the hour as Ivan Sproule's run set up Adam Lecky to score.